It’s actually one of my favorite ways to sneak in some greens, veggies and extra protein – apart from smoothies! There are certain veggies that have such a subtle and even sweet taste, that you won’t notice them at all in your treats! The most commonly used ones are zucchinis, avocado, beans, carrots, sweet potatoes, pumpkin and even sauerkraut! 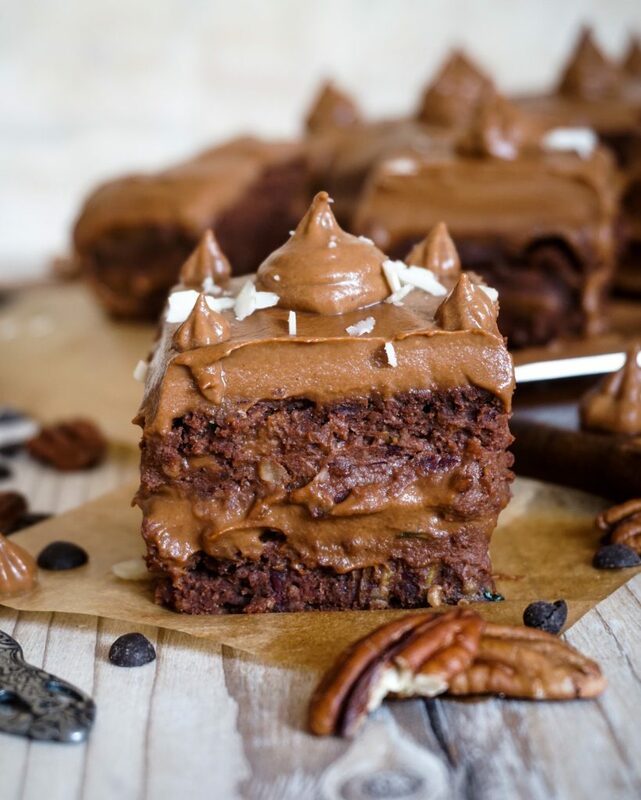 Back to these delicious Chocolate Zucchini Brownies with Sweet Potato Frosting! 🙂 I decided to cut the brownie in half to add an extra layer of the smooth sweet potato frosting in between! Turns out that sweet potato serves as an equally great base ingredient for a rich chocolate frosting as avocado. It might even be a new favorite as it’s much lower in fat and even healthier! As if 2 veggies weren’t enough I’ve also added black beans to the brownie base, just because I have had such good experience with bean brownies and they always give a yummy texture. Now, If you’re thinking – ugh, how can this possibly taste any good?! 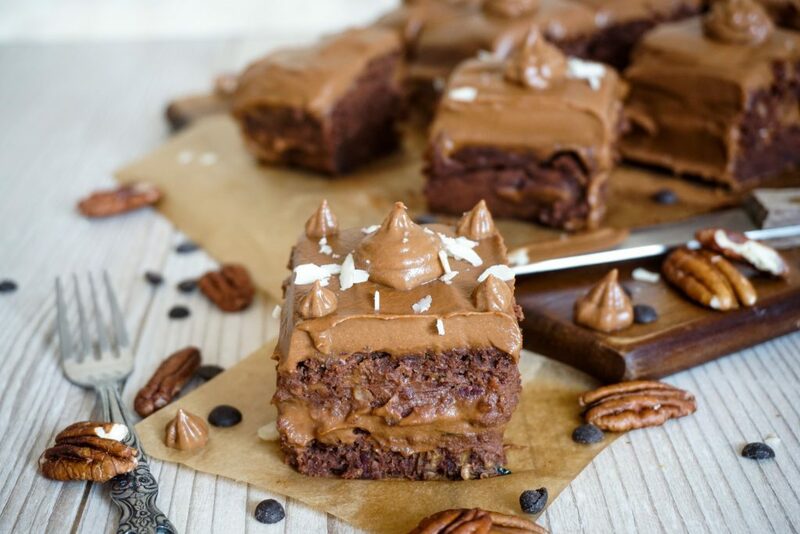 Well, I gotta tell you it’s these brownies are mother, grandmother AND neighbour approved – all of which aren’t vegan and didn’t taste what’s inside at all! Preheat the oven to 175°C/350°F and line a square baking tin with parchment paper. Add all the dry ingredients to a bowl and whisk together. Add all the liquid ingredients (except for flax eggs & zucchini) to a blender. Blend until you have a smooth mixture 1-2 minutes. Pour the wet mixture into the bowl with the dry ingredients. Add the flax egg, grated zucchini and vegan chocolate chips (optional). Whisk together with a spatula or hand mixer until smooth. Pour the batter into the baking tin and spread evenly. Place in the oven and bake for 40-45 minutes until a toothpick comes out clean from the center. In the meantime, prepare the sweet potatoes and steam/cook them until soft. Place into a high-speed blender with the remaining ingredients and mix well until very smooth. You want a smooth but firm frosting. Transfer to a bowl and refrigerate. Once the brownies are done, let them cool down for 30 minutes. Cut the brownies in half (I used a flossing string) and place a layer of the frosting on top of the base layer. 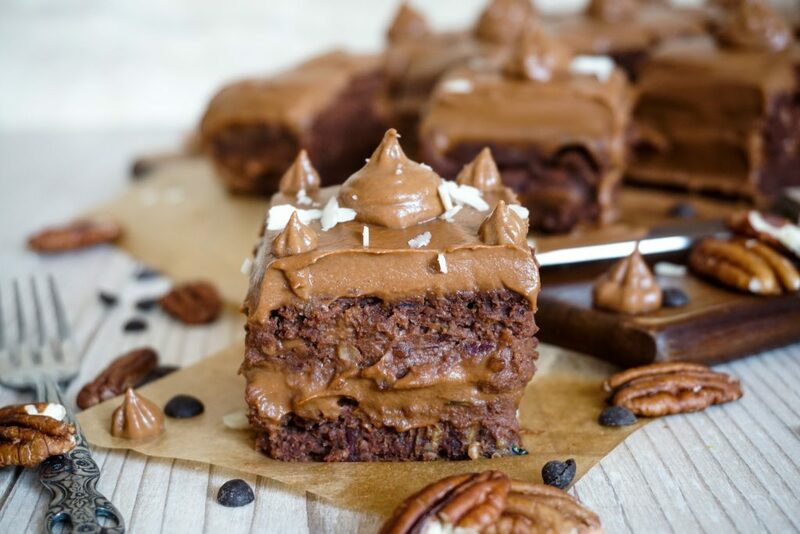 Place the second brownie half on top and add the remaining frosting on top and on the sides. Decorate as you wish and serve! Stores in the fridge for 3-4 days. 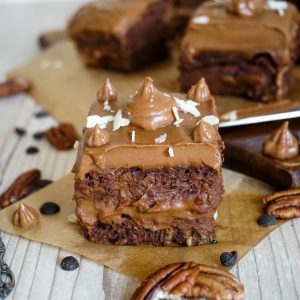 I loooooove this brownie, it’s the best I’ve ever made (vegan or not vegan). I used coconut blossom syrup with rice syrup instead of maple and chia eggs instead of flax eggs. The result is perfect. The frosting is just the best, wonderful!!!! This looks amazing. But what was the approx. amount of sweet potato in grams or cups? Thanks! 🙂 I’d say probably around 2 cups steamed sweet potato! Can we have this recipes in french please? Is there a possibility to avoid beans? What could be the substitute?